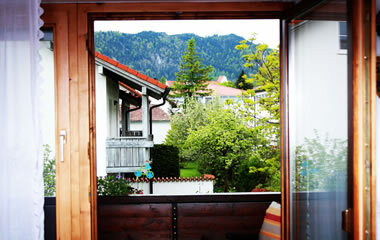 As a very nice alternative, in the event that the Maurus House has no vacancies, we offer accommodation in a fully-equipped apartment in another location in Füssen. The apartment is in a quiet area, yet very close to the city center. This apartment (max. 4 occupants), which was newly renovated in November 2016, has a separate bedroom, shower/WC, a full kitchen, and a balcony. Of course you'll have WLAN at this location, too.